This series is composed of four exercises designed to relax tension as quickly and efficiently as possible in some of the major areas where tension builds up: back, chest, shoulders, neck, and face. All the exercises are based on the same principle. Various body parts are tensed on the in breath and relaxed on the out breath. Every out breath is an opportunity to let go—cooperating with gravity. Before we begin, take a moment to notice your breathing. If it’s in your chest, breathe a sigh of relief and watch your belly expand like a balloon on the next in breath. Now notice your torso. Your whole upper body rises up on the in breath and sinks back down on the out breath, letting go to the pull of gravity, which is a natural ally. A lot of useless tension gets created by opposing the pull of gravity and contracting muscles that aren’t even being used. The best way to learn these exercises is to read through the text and practice what we’ll be doing in a general way. Next, look at the illustrations and imagine how each exercise will feel. 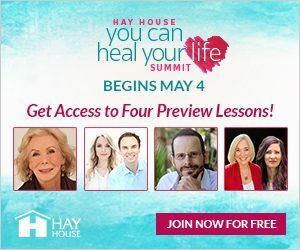 You can also follow along on the CD, Meditations for Relaxation and Stress Reduction or on the DVD, Inner Peace for Busy People where these exercises are included as bonus material. For now, sit comfortably in your chair with both feet on the floor and your arms resting lightly on your thighs. Now…notice your jaw muscles. Are your teeth clenched, which tightens the jaw, or is the lower part of your face relaxed? Let your teeth relax, your mouth open slightly, and your jaws soften and relax a little more on each outbreath. Now, notice your eyes. Let them soften as you breathe. Now your shoulders. Are they tensed up? Perhaps there’s room for them to drop further down, a little bit more on each outbreath. Let your arms and hands relax more, feeling heavier and heavier as they rest on your legs. Take a deep breath and let your chest muscles relax. Finally, feel your relaxed belly expanding and contracting with each breath. The four yoga stretches that follow will allow you to let go of even more tension. Make a note of where you feel residual tension right now so that you can check your level of relaxation at the end. Move to the edge of your chair. With eyes closed so that you can pay closer attention to inner sensations, notice how your back feels. On the next in breath, arch gently backward (A), stretching your spine only as far as feels comfortable. 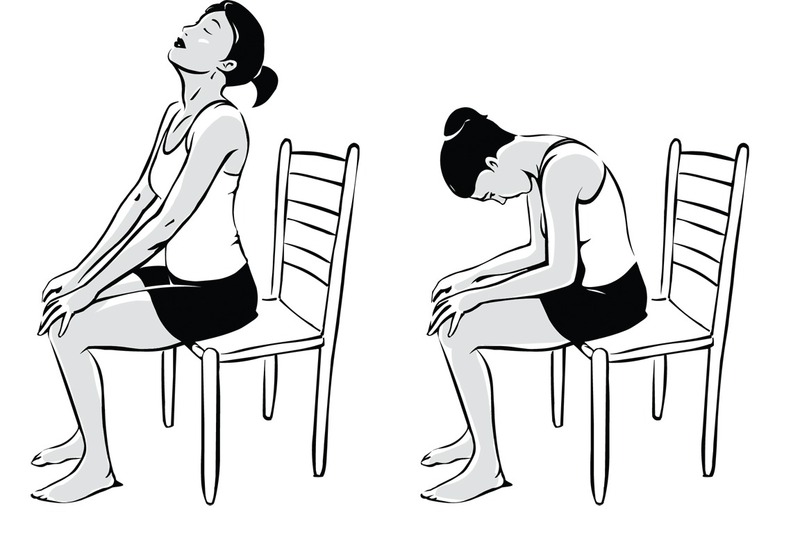 Exhale and round your back (B), rolling your shoulders forward and letting your head fall gently forward. Repeat three times, keeping full attention on breathing, stretching, and letting go. Inhale and pull your shoulders up to your ears, (A). Now rotate your shoulders backward, pulling the shoulder blades together (B). Exhale with a sigh and let go (C). Repeat three times. Notice that when you pull your shoulder blades together, you are giving the chest muscles a nice, relaxing stretch. Exhale and drop your head toward your right shoulder, taking care to relax your left shoulder so that it doesn’t rise up. Feel the gentle stretch on the left side of your neck, letting your head drop further toward your shoulder naturally for three outbreaths. Let gravity do the work and don’t strain at all! Bring your head back up. Exhale and drop your head very slowly toward your left shoulder, taking care to relax your right shoulder so that it doesn’t rise up. Feel the gentle stretch on the right side of your neck, letting your head drop further toward your shoulder naturally for three outbreaths. Remember to be gentle with yourself, surrendering to gravity rather than straining. Bring your head back up. 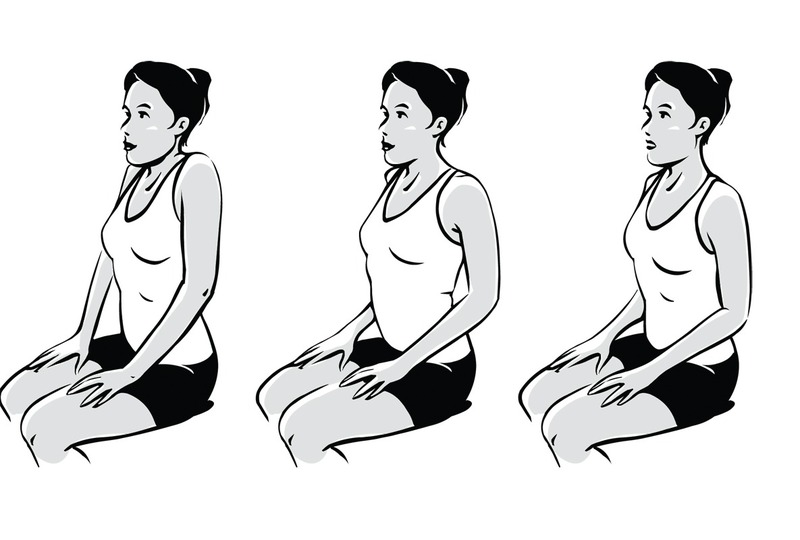 Exhale as you bring your chin toward your chest. Take three breaths, relaxing a little bit more on each outbreath as you feel the back of your neck gently stretching and your face becoming softer and more relaxed. Bring your head back up. Exhale and drop your head toward your back, letting your mouth fall open. You’ll feel a gentle stretch to your throat as the back of your neck softens and relaxes. Continue for three breaths and then bring your head back up. The facial exercises are done in two steps. First, inhale and scrunch all your facial muscles in toward the center (A). It’s as if you’re trying to squeeze all the tension right off the tip of your nose. Exhale and let it go. SMILE! Now inhale and open your mouth wide, lifting your eyebrows to make your face very long (B). This is like a yawn. When you exhale and let go, you may even find yourself yawning. SMILE!